1st row: Sally Exford, Beverly White, Judy Towne, Patricia McCormick, Margaret Kirkey, Sally Typhair. 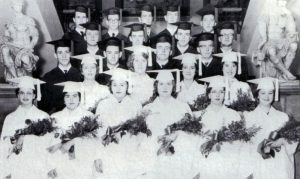 2nd row: Gail Hatch, Mary Anne Guiles, Anna Bullock, Alice Webb. 3rd row: Frederick Whitmarsh, John Towne, Fred Whiteford, Everett Colton. 4th row: Gail VanWald, Gary Coloton, Richard Harmer, Albert Dumoulin. 5th row: Russell McEwen, Leo Laddison, Robert Church, Russell Tuttle, Charles Taylor.